William Henry Welham - b. 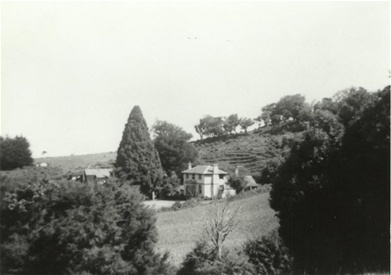 22/2/1886 Waipori, Otago d. 21/04/1958, was a grandson of Nathan Welham and eldest son of Henry Samuel. He married Ellen Margaret Egan (b. 31/10/1881 Longridge- d. 1953) on 23/06/1908. Ellen Margaret (right) with sister Mary. Ellen - b. 26/07/1908 - d. 4/12/1991. William Henry - b. 20/09/1909 Mataura – d. 2/09/1991. James - b.12/04/1912 - d. 28/08/1986. He married Elizabeth Brown (b. 18/08/1921- d 1994) on 21/06/1942. He married Maisie M.B. Fisher (b 13/01/1917 – d. ) on 21/01/1944. He married Christina Ness (b.22/12/1924 – d. ) on 02/11/1946. William & Ellen's children. 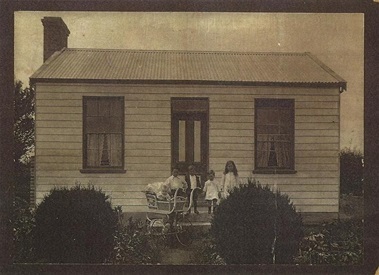 Photo taken at Wailouiti, South Island about 1916. From left: Danny in pram, Bill, James, Cecil & Nell. Farming at Brockville, Dunedin, New Zealand. Written by Daniel (Danny) Welham - great grandson of Nathan Welham. Apparently it was a continual struggle for my mother (Ellen Welham, nee Egan b.31/10/1881 Balfour, Southland N.Z )and she and my father (William Henry Welham b. Waipori, Otago, N.Z.) separated about 1925. Secondary education was not possible for any members of our family for financial reasons. My mother was left with five children to support in any way possible. Early in the depression years of the early 1930’s she took in some boarders – young ladies who worked at the Roslyn Mills. She and Nell worked long hours with this project with limited reward. The unemployed scheme was operating at this time and we were able to clear an area of bush and so improve the farm in a productive way. Another source of income was the timber on the property. Firewood was carted around the local districts and sold for about 14 sacks for one pound. Many blue gum trees were felled and loads of mine props sold to the local mining firm in Fairfield. Dispite long hours each day – I suppose we were fortunate that we always had good plain food and a little pocket money sometimes. 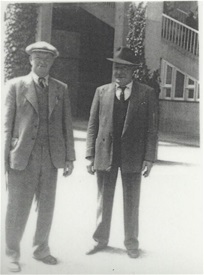 As more work became available in the late 1930’s – Cecil and I left the farm – he took on a small cartage business. After working night shift at the Mill for about 18 months, I moved to Lower Hutt because there was a variety of work available. Bill and Jim continued on the farm until the war years – then Bill and Gladys carried on. After the war they wanted to leave, so my mother requested that Nell & Andy McCammon shift back from Invercargill to run the farm. 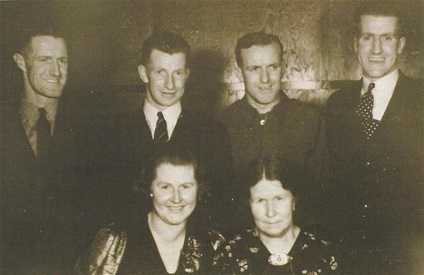 After Mum died in 1953 and later Andy died suddenly – it was decided by the family to sell the property to enable Nell to get financial help as she had three sons at Secondary School to support. The property was finally sold during 1955. 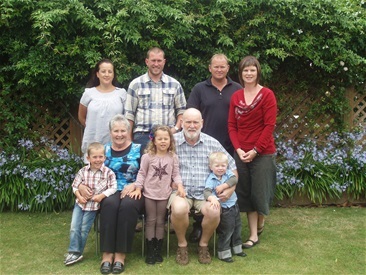 Welham family farm, Brockville, Dunedin. From left back: Bill, Jim, Danny & Ginger. 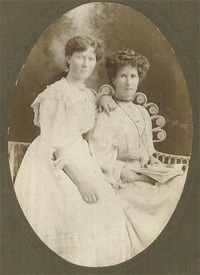 Front Row: Nell & Ellen (mother). Danny served with the N.Z. Army Engineers in the Pacific and Middle East, after training at Trentham in the Hutt Valley. 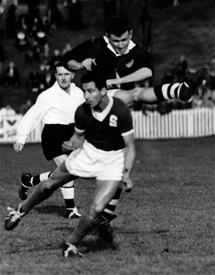 He became a soccer referee and for FIFA refereed Auckland/NZ vs Costa Rica in 1959. 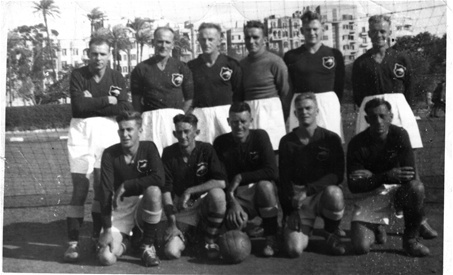 Danny playing goalkeeper for the N.Z Army Soccer team in Cairo. He is in the middle of the back row, wearing a different jersey from the other players. 1959 - FIFA referee for Auckland/N.Z.vs Costa Rico. Danny is in the background. Joy Manson (nee Welham) daughter of Bill; and family. Back Row - left to right: Jelena, Andrew, George, Sonia Front Row - left to right: Nikola, Joy, Leni, George (Joy's husband) and George. Photo taken January 2012. Jenny Richardson (nee Welham) elder daughter of Jim; and family. 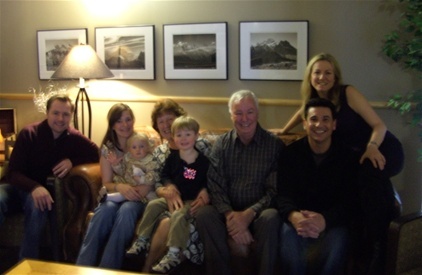 From left: Mark, his wife Alice holding granddaughter Georgia, Jenny holding grandson Matty, Bruce (Jenny's husband), Claire and her partner Chris Gayen. Photo taken March 2010.